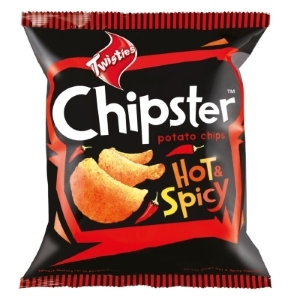 In what’s arguably the hottest segment in the printing related industries, flexible packaging, TC Transcontinental has announced the acquisition of Flexipak, a Montreal-based flexographic printer of bags and stand-up pouches. TC Transcontinental (TC) is a $1.6 billion (USD) printing and publishing company headquartered in Montreal with significant positions not only in printing but also in publishing newspapers and magazines, primarily serving Canadian audiences. With the obvious headwinds that these segments are facing, company management made the strategic decision to begin building a portfolio of packaging assets, utilizing their printing expertise, specifically web-based roll-fed technologies in which the company excelled in their high-volume operations. 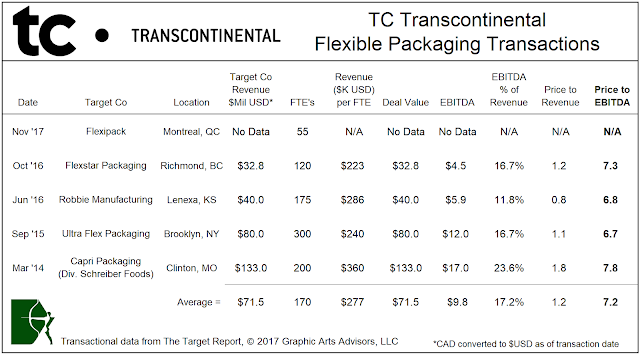 At the onset of this strategy in March 2014, when TC acquired its first flexible packaging company, François Olivier, President and CEO of TC, stated that the deal was the first indication of the company’s new strategic plan to grow through diversification. He added that flexible packaging was identified as a natural fit since the production process was in many ways similar to their current operations that ran roll-fed substrates and the market offered opportunities for growth. (see The Target Report – March 2014). Viewed from the perspective of its M&A activity, the company has remained laser-focused on implementing this strategy. In our opinion, this is a great example of a planned, disciplined, articulate and well-executed strategy. The plan utilizes the company’s financial strength gained from its traditional foundation, in this case printing newspapers and magazines, to build out an entirely new expertise in a much more desirable (and likely sustainable over the long term) segment of the printing industry! TricorBraun, a large manufacturer of rigid packaging (glass and plastic containers), with over 40 global locations, acquired Taipak, a flexible packaging printing company in Richmond, British Columbia. With this acquisition, TricorBraun, owned by PE firm AEA Investors, establishes its first foothold in the flexible packaging industry. Graphic Packaging, the multi-billion dollar publicly-traded company that just last month took on the $1.6 billion consumer packaging division of International Paper Company, has announced another, albeit much smaller, acquisition in its sweet spot, the folding carton segment. The company is acquiring Seydaco Packaging, a folding carton printing company in Mississauga, Ontario with $40 million in revenues. EBITDA was reported being in the low double digits for the last twelve months, at a price reported that will be slightly less than 6 times EBITDA on a post-synergy basis. Nosco is back on the deal-making path only a month after its last acquisition (see The Target Report – October 2017), this time acquiring the Knight Packaging Group located in Chicago. The acquired company is a departure from Nosco’s pharma-focused offerings, as Knight services the food industry, consumer products, as well as OTC products, offering packaging technologies such as blister packs and gabletop cartons, in additional to traditional folding cartons. In the label segment, Western Shield Label acquired DAC Labels & Graphic Specialties, extending from its California base to the acquired location in Dallas, Texas. USA/Docufinish, a label printer in Yorkville, Illinois, was acquired in a management buyout. Kingery Printing Company, a commercial web and sheetfed printing company with operations in in Effingham and Henry, both in Illinois, acquired United Graphics* in Mattoon, Illinois. In addition to providing commercial printing services, United Graphics brings expertise in book printing and binding to the newly combined companies. Anstadt Communications, based in York, Pennsylvania, reached all the way to Milwaukee, Wisconsin to acquire Central File Marketing, a provider of direct mail and marketing services specializing in the rent-to-own industry. * Graphic Arts Advisors, publisher of The Target Report, served as advisors to Kingery Printing Graphics in this transaction.